Long back I wrote an article on creating a language translation bot using Skype and C#, since Microsoft stopped Skype COM API, and I am using lync more than Skype, I thought of writing the same implementation using lync. The implementation is pretty same, you have to get the instance of the lync instance first, attach event handlers, translate and return the text back. To make this post simple, I am not including the translation logic, I am reversing the text and sending back to the sender. You need to install the Lync SDK to start using the lync APIs, which you can download from here. 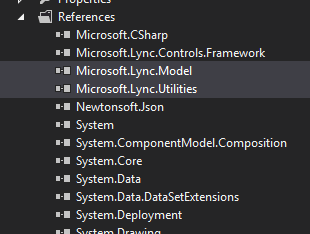 You need to add reference of Microsoft.Lync.Model and Microsoft.Lync.Utilities DLLs. And here is the code snippet. Reverse method reverses the text and send back to the user using BeginSendMessage method. You can extend the bot MEF and custom plugins.